Mallory Palmer was born in Chagrin Falls, OH. This small town, near Cleveland, was a picturesque place to grow up, and on balance her early childhood was both uneventful and reasonably stable. Her parents, William and Samantha Palmer, raised her as an only child in a humble home set against the woods where she would often spend her days. There was very little indication that there was anything peculiar about her at all until she was much older. Not long after she had received her driver's license Mallory, now almost always going by "Mal", was involved in a fairly horrific accident. Or at least she would have been. When he car was forced off the road by a drunk driver it went careening down into a small ravine below. She remembered being absolutely certain the impact would take her life, closing her eyes and bracing for it, and counting what seemed like an eternity of instants as the ground fell out from under her. Only, this was not to be. In the next moment she was at home, and had fallen into her own bed. Terrified, and convinced she was losing her mind, it was not until she returned to the scene of the crash that the reality of what transpired really sunk in for her. In the following months, this primary incident seemed to stem others. She was having more and more trouble keeping track of herself. This experience was beyond bewildering, and the consistency of our surroundings is something most humans take for granted. She would travel without warning from one place to the next, instantaneously. For a while this was manageable. People have a tendency to believe their eyes are playing tricks on them far more often than the believe they witnessed the incredible. With some effort she could do this at will, but more often it seemed she was at this new power's mercy. The breaking point finally came in the last days of her junior year of high school. She was working a part time job at gas station just off the main road. It was a good fit for her because often no one was around. It made concealing any "incidents", as she had come to think of them, easier to manage. One evening, just before her night shift replacement arrived the store was robbed. A man in a mask held a gun across the counter and threatened her. She was panicked, and even more so that in this one moment where she, more than anything, wanted to disappear, she could not. Frozen and unable to speak the man started shouting and waving the gun. She couldn't muster the presence of mind to even make out his words. That was the most of the first "event", as PRIMUS officials would later refer to it. Mal's memory of this is too fragmented to sort out the details in any sensible pattern but in a few fractions of a second the gas station and everything in it ceased to be. The Fire Department and Chagrin Falls Police arrived on the scene and were simply beside themselves. What had once been the corner Quick Stop Station was now a crater in the broken pavement. There was nothing left. PRIMUS agents were immediately alerted and an investigation team was dispatched via protocol. They later found Mallory hiding in the nearby woods in a state of shock. Later investigation would show what actually happened. In her panic, Mallory had produced a violent singularity. It was chalked up to a latent self defense instinct. Thankfully it was too unstable to remain open for long, but even for it's duration, estimated at nine tenths of a second, it had absorbed and atomized every object on the premises, including her unfortunate assailant. Official reports in Chagrin Falls describe a safety failure that led to a explosion that cost the lives of Mallory Palmer and an unidentified customer. There was a school wide memorial service the following weekend for Mal. She would later watch the video from her room in PRIMUS custody. This incident caused many logistical problems. The initial cover-up was bad enough, and if it weren't for the extenuating circumstances the amount of force used to dispatch Mallory's attacker might have landed her with criminal charges. But this was not the most pressing matter at hand. Mal's abilities were both obscenely dangerous and resided in the hands of a young, not yet mature girl who was both terrified and unreliable at controlling them. Several backroom conversations involved the use of drugs to keep the girl in a medical coma merely to avert the risk that this happen again. If she could not be contained she was literally a threat to well being of every man, woman, and child on the planet. These debates went on for sometime while Mallory was kept sedated. Eventually it was decided that despite the danger, there was no means to justify that draconian a method of containment. PRIMUS scientists spent nearly six months pouring over her with every test they could devise. Isolating her mutation came early, finding a solution to inhibiting it was a much more strenuous process. Eventually on site engineers developed a series of dampening devices to inhibit the signals in her nervous system that activated her abilities. These devices remain the primary function of her power armor to this day. It houses no weapon systems and diverts almost all of its systems to the purpose of keeping Mallory from losing control. The consequences of its failure could be catastrophic. There were talks to install fail safe systems that were quite controversial. If the control devices failed, one administrator argued, it might be regrettably necessary to have a means to remotely terminate the subject. The results of this argument are undisclosed, as are much of the proceedings that followed her discovery. With the prototype control systems in place, Mallory was revived. Furious and confused she demanded to be allowed to speak to her parents. After nearly a week's hunger strike she was allowed to do so. The Palmers, having believed their child dead for over four months, were both relieved and outraged beyond the point the words can be used to describe. They threatened every form of legal avenue available to them to get their daughter back. What followed were a series of meetings explaining the situation all parties now found themselves in. In the end, it was Mallory herself that finally brought the two sides together. She admitted she understood the danger and agreed to remain under PRIMUS supervision. The department of Risk Management assigned her a case worker and she was made an official PRIMUS asset. This was exceedingly boring at first. Mostly her life was isolating and uneventful. However, through the contacts she made with other heroes and the side by side work she came to do with PRIMUS researchers, over time she came to both understand and find some mastery over her abilities. When she came of age she applied for registry as a proper hero, wishing to work alongside those people who had inspired. Though she is indeed a special case, and there remains persons of interest watching over her activities on a nearly constant basis her progression over the years has won her some autonomy. She is still required to report her movements to PRIMUS agents and maintain close contact with them on her condition, including weekly reports and any, even the most insignificant "incidents" to the RM department, but her life is slowly starting to feel like her own again. Her most recent assignment has been Millennium City. It was by her own request. She wished to be involved where she felt she could be most useful. Compared to where she grew up, the the limiting confines of PRIMUS labs and personnel facilities, the expansive and vibrant environment of its streets and gargantuan buildings is overwhelming. These are the first days of her career but she's not out to make a name for herself. Officially speaking, Mallory Palmer is dead, she's identified only by her PRIMUS codename, and now her registered hero moniker, Amateria. Amateria's powers seems to stem from an ability to manipulate the still rather mysterious Higgs field. Though it's been arduously studied, PRIMUS researchers have yet to isolate how she manages to effect the field at all, but through it, as a conduit of sorts, she can alter how much mass is imbued in an object via the field, altering it's physical properties, especially gravity, immensely. What is known is that the cells in her body contain an extra organelle that appears to facilitate this process. Appearing much like mitochondria, these mysteries organic constructs come alive with each use of her abilities. It is by this method that she is able to push the boundaries of particles mass to extreme quantities and fold the space around them in upon themselves to generate singularities. Doing so in the presence of others requires a lot of concentration as it's not enough to manipulate the singularity itself, she must maintain the gravitational integrity of the environment surrounding it or risk unwanted objects or persons crossing the event horizon and escalating the strength of the black hole. With proper control these singularities will evaporate when the principle mass that fuels them subsides. This too is a function of the Higgs field. In theory, it may be possible for Amateria to use this power to destabilize a naturally occurring black hole but research suggests that the parameters for such a test are untenable. There can be no understating the danger of a black hole, despite the relative size of Amateria's singularities, the principle physics remains the same. Once an object crosses the event horizon there is no coming out. The molecular structure of the object will be broken down into an increasingly smaller stream of particles approaching the singularity where the mass is infinitely dense. Beyond this point space-time becomes so warped that attempting to evade this is futile because the singularity is already in the objects future. There is no escape. Using the tendency of extreme gravity to alter the curvature of space time to bend or fold the space around her to move objects, often herself, instaneously. She doesn't ever accelerate and to the observer this appears much like teleportation or an extreme burst of speed. Joining two very distant points of space is very difficult to achieve as its less intuitive to the human brain than a jump to a space one can see. This is likely a mental limitation rather than a true lack of ability. One very complicated problem that diminishes the practicality of long distance wormhole travel is that the relative speed of her movement compared to her surroundings would often mean that an instantaneous journey for Amateria would be an exceedingly long time for everyone else. In theory if it were possible to create a bridge to the nearest star system, when she returned it would likely be a different decade than the one she left. Studies in PRIMUS labs have shown that her experience of time is often much less than those around her while exercising her abilities. Much like time passes a scant few microseconds slower at the top floor of a skyscraper compared to the ground floor. Calculations suggest that due to frequent use of this power she may be four full months younger than her age as calculated by her birth date. One major consequence of her abilities is that when she deploys a defensive singularity in close proximity to her person, the effect this has on the space around her is warping to such a degree that the time experienced on her end compared to that of the outside observer is incredibly distinct. Even objects travelling at incredibly high speeds appear to slow to a crawl at they approach the singularity, giving her the appearance of incredible reaction speed and natural reflexes. In reality her reflexes are entirely human but she literally makes more time for herself in which to have them. Physics Education - In an effort to better understand herself and her abilities on an intellectual level, Mallory has undergone an extensive amount of schooling while working with PRIMUS. She has received a bachelor's degree of science with a concentration on Astrophysics. Acrobatics - Despite the potency of her abilities, without the natural invulnerability some heroes are blessed with, her remarkable frail human frame requires a good deal of both cunning and agility to protect. She spends a good deal of time training to remain fit enough to keep up with the rigors of her work. Musical Talent - Due to an enormous period of time in her life when she was isolated from socializing, Mallory took up the violin as a hobby. Her early days of screeching mistakes had no one to bother. Now after a few years of practice, she's not a master but an impressive amateur. PRIMUS Bio-Dampening Armor - Amateria's attire while engaged in her duties appears very much like a supportive power armor of some type, the like that can supply the bearer with shields or extra ablative protection. And while, to a limited extent this is true it's primary function is actually debilitating. Due to the nature of Mallory's powers and the risk she poses to both herself and others around her, the nearly constant need to wear some kind of dampening device is central to her life. She can never go without it. At times she's considered looking into invasive surgery to see if such devices could be subdermally implanted just to give her the feeling of some normalcy while doing the most routine tasks like bathing. Thankfully there are compact forms of these devices she often uses while not on duty it is still a constant worry that her powers will take hold of her and not the other way around. The sensors throughout her armor try to monitor signals within her nervous system to allow for her to use her powers within a certain acceptable range. PRIMUS RM Tracking Device - PRIMUS agents in the Risk Management department have mandated that for her authorization to work in the United States be permitted she must agree to remain under some extensive supervision. 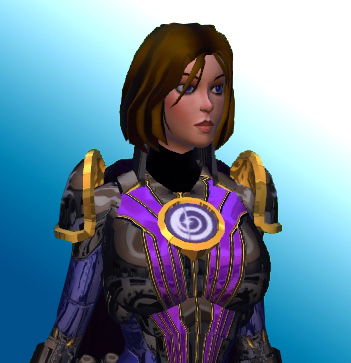 Both her armor and her miniature dampening devices are fitted with quantum entanglement tracking systems. These advanced pieces of hardware are necessary to maintain a read on where and when she is at all times. PRIMUS Communicator - Functioning on a similar level as the tracking system, this advanced bit of hardware helps her maintain contact with PRIMUS even while under the most intense gravitational and spatial distortions. Having spent much time in seclusion, and being somewhat awkward when it comes to socializing in general, Mallory doesn't leave much of a lasting impression. She actively tries not to. Most of her records are sealed, but those individuals with high level clearance within PRIMUS may very well have heard of her due to the high level of concern she's caused so many officials. She's an unfortunate case in this respect because she gives off the impression of someone who would have chosen a different life otherwise. Maybe she would have been a concert violinist in another life, but it was not in the cards. Though she occasionally receives some credit from individuals whom she's helped in her career she often does her best to avoid cameras and duck publicity. This page was last modified on 11 June 2014, at 08:25.